OVERVIEW: I was tempted to remove the cautionary note from our Market Gauge this weekend as some distribution days have dropped off the indices due to time, the Nasdaq Composite and Russell 2000 closed the week back above their prior break levels and the indices held their longer term trend lines for the most part. However, as we saw Friday, the markets are still very vulnerable to trade news and algorithms quickly take over moving markets very quickly. The markets are still very tradable to the upside, but we feel curtailing your activity, or position size may be prudent right now. The Russell 2000, that has been lagging just a bit recently, outperformed on Friday closing back above its prior breakout level. Markets confirmed a new uptrend back in April and those trends remain in place, although the trend in small caps is a bit more tenuous right now. 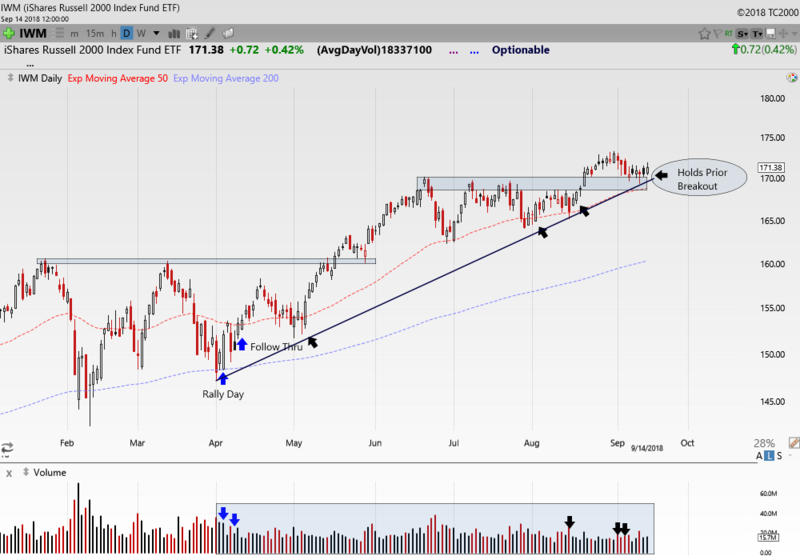 Let’s take our weekly look at the charts and see how we shape up heading into next week. SPY- The trend in the S&P 500 continues to look solid. After hitting the upper end of its bullish channel in late August, the subsequent pullback seems to have held after having tested the previous breakout level. 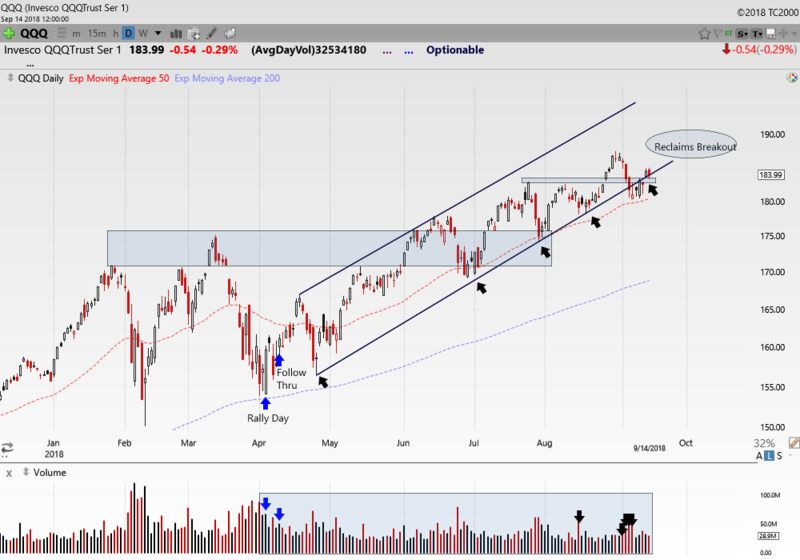 Distribution days have been pared down to two over the last 25 sessions leaving a healthy look to the index, and as of Fridays close it sits comfortably above the 50 day EMA. I will reiterate however, that corrective action in the indices does not necessarily have to preannounce itself in the form of building distribution days. This market is still vulnerable to trade news and any announcement of failed talks or added tariffs could hit the market in a hard way. It is true there is always something to worry about in the markets so we continue to trade, but we must always remember to respect risk, honor our stops and cut losses short. NASDAQ- The Nasdaq Composite survived a test of the longer term trend and jumped back above its prior breakout level during Thursdays session and was able to hold there to close the week. Distribution days, which had been somewhat of a concern last week, have been pared down to four and we have not registered a fresh distribution day in over a week. Application and Infrastructure Software names remain hot helping to buoy the index. QQQ- Late last week the Nasdaq 100 sold off crashing thru the prior breakout level and slicing across the longer term uptrend line. The selling stopped just short of the 50 day EMA early this week and price jumped back above the breakout level. Friday saw some back and forth action with the index holding the breakout level but closing slightly back below the trend line and we did, just by a whisker rack up a distribution day. Its always nice to stay above trend lines, but I feel the 50 day EMA is always a more important support level. We added a distribution day here as quickly as we dropped one on Friday so the count remains at six days over the last 25 sessions, enough to keep our attention. IWM- The small caps have lagged a bit recently and the index is trying to hold the former breakout level near $170. It would have been nice for the index to pull further away from resistance with the August breakout but we don’t always get what we want in the markets. Perhaps we are building a base right on top of the prior one, only time will tell. A slight adjustment to the trend line this week still shows the index holding tight and distribution days have been dwindled down to only three. Let’s hope Fridays outperformance is a sign of things to come. Join us at our Premium Site, http://www.ttptrading.com, for real-time stock and option alerts. You get access to myself as well as Greg Krupinski of GK Trading for one low price of only $69 per month. Here you will also receive weekend watchlist videos, detailed trade and market analysis on a nightly basis and more. See you there!